I find myself caught between the need to follow the drone debate and the need to avoid unpleasant memories it stirs. I used drones – unmanned aerial vehicles – during the nadir of my military career that was an operational tour in Afghanistan. I remember cuing up a US Predator strike before deciding the computer screen wasn’t depicting a Taliban insurgent burying an improvised explosive device in the road; rather, a child playing in the dirt. After returning from Afghanistan at the end of 2009, I left the British army in 2010. I wanted to put as much distance as I could between myself and the UK, leaving to study in America (where I still reside). By doing so, I inadvertently placed myself in the country that is spearheading development in drone technology and use, highlighted by each report of a drone strike and the usual attendant civilian casualties. Political theorist Hannah Arendt described the history of warfare in the 20th century as the growing incapacity of the army to fulfil its basic function: defending the civilian population. My experiences in Afghanistan brought this issue to a head, leaving me unable to avoid the realization that my role as a soldier had changed, in Arendt’s words, from “that of protector into that of a belated and essentially futile avenger”. Our collective actions in Iraq and Afghanistan after 9/11 were, and remain, futile vengeance – with drones the latest technological advance to empower that flawed strategy. Drones are becoming the preferred instruments of vengeance, and their core purpose is analogous to the changing relationship between civil society and warfare, in which the latter is conducted remotely and at a safe distance so that implementing death and murder becomes increasingly palatable. 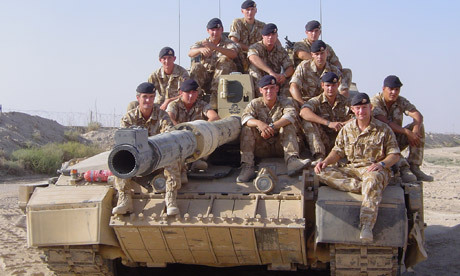 The author (at far left) as a lieutenant Challenger 2 troop leader in al-Amarah, Iraq, 2004. Photograph: James JeffreyHyperbole? But I was there. I sat in my camouflaged combats and I took the rules of engagement and ethical warfare classes. And frankly, I don’t buy much, if any, of it now – especially concerning drones. Their effectiveness is without question, but there’s terrible fallout from their rampant use. Both Pakistan and Yemen are arguably less stable and more hostile to the west as a result of President Obama’s increased reliance on drones. When surveying the poisoned legacy left to the Iraqi people, and what will be left to the Afghan people, it’s beyond depressing to hear of the hawks circling around other theatres like Pakistan and Yemen, stoking the flames of interventionism. I fear the folly in which I took part will never end, and society will be irreversibly enmeshed in what George Orwell’s 1984 warned of: constant wars against the Other, in order to forge false unity and fealty to the state. It’s very easy to kill if you don’t view the target as a person. When I went to Iraq as a tank commander in 2004, the fire orders I gave the gunner acknowledged some legitimacy of personhood: “Coax man, 100 meters front.” Five years later in Afghanistan, the linguistic corruption that always attends war meant we’d refer to “hot spots”, “multiple pax on the ground” and “prosecuting a target”, or “maximising the kill chain”. The Pentagon operates about 7,000 drones and asked Congress for nearly $5bn for drones in the 2012 budget. Before retiring as air force chief of staff, General Norton Schwartz was reported as saying it “was ‘conceivable’ drone pilots in the air force would outnumber those in cockpits in the foreseeable future”. That’s not a brave new world, far from it. The encroachment of drones into the civilian realm is also gaining momentum. President Obama signed a federal law on 14 February 2012, allowing drones for a variety of commercial uses and for police law enforcement. The skies above may never be the same. As with most of America’s darker elements, such as its gun culture, there’s profit to be made – the market for drones is already valued at $5.9bn and is expected to double in 10 years. During my time in Afghanistan, drones were primarily supplied by the US as our drone capability was miniscule in comparison. The British military still relies on US support, only owning about five armed drones. They have been busy, though: as of May 2012, the Ministry of Defence confirmed these had flown a total of 34,750 hours, and fired 281 missiles and laser-guided bombs. With continued cuts to the British army’s personnel levels, it isn’t hard to envisage drones increasingly replacing boots on the ground. And since the UK already has the world’s highest number of CCTV cameras, the intrusion of drones into surveillance Britain doesn’t require much imagination. Technological advancements in warfare don’t have a good track record in terms of unintended consequences. As Chris Hedges reveals in his book War is a Force That Gives Us Meaning, an estimated 62 million civilians perished in the 20th century’s wars – “nearly 20 million more than the 43 million military personnel killed”. Will the 21st century repeat such foolish tragedy? Many years still remain. I’d argue we should err on the side of caution and remain immensely wary of drones.